Man, I am so sick of being cooped up in the house. With the wildfires burning all over Northern California, our air is completely filled with smoke. You can actually smell the smoke outside and the visibility is like it's foggy out. I certainly can't take my three month old baby outside and since she goes where I go, we are spending lots of time indoors lately. So, if you have any great ideas for me to keep myself occupied while inside all day, let me know! 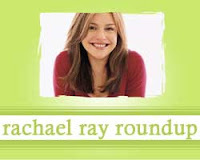 Did you see the crockpot segment on Rachael Ray's talk show this week? Check out A Year of Crockpotting, where Stephanie shares a ton of details about her experience with the show. The Budget Fashionista shows us how to get Rachael Ray's look for less. Yumsugar discusses the appearances of the finalists from the Next Food Network star on Rachael Ray's talk show. Andrea at Nummy Kitchens tried rachael's recipe for Summer Corn and Tomato Salad. The Cat's Pajamas features a post all about Rachael's recipe for Pressed Cuban Sandwiches. Karen at Busy Mamas tried a recipe I was thinking of giving a go - Grilled Sausage Salad with Ginger Crostini. Susan at Fork You (love that title) made a great summertime recipes from Rachael Ray's magazine Spring Pea-sto with Whole Wheat Penne. Eudora at the Christian Science Monitor wishes Rachael Ray's 30 minute meals and all the stuff that goes along with them were around a few years ago. Sheila at Sheasy Time tried Balsamic Glazed Grilled Plums with Vanilla Ice Cream. hey there, great round up post as usual. I didn't know about the fires, sorry to hear you are stuck inside and I hope you are going to be okay. Are you into scrapbooking? Maybe give that a go? Or relax and read some books? Print off your photos? When I have time like that I like to organise. Clean out cupboards, organise gift list for Christmas, or the year. Or, worst comes to worst, more cooking Rachael's recipes! Thanks for picking up my post on Rachel. And for leading me to your blog - I love it! Usually I write reviews about local restaurants in West Virginia, but when I am not out "Forking" some unsuspecting restaurateur, I love to cook at home. Cooking Light, Southern Living and (of course!) Rachel Ray are the most-referenced sources in my household. You are going on my favorites list so I can check back and see what other recipes you've tried. I tried those plums--they're to DIE for! How's the baby--hope everything is going well! I'm thinking about doing a "What's your favorite cooking show?" on my blog. Would you be interested in blogging for RR? Let me know! Andrea - your post was sent to me through my Google Alerts, which is how I find most posts for the Roundup. Madeline that is so neat! I didn't even know what google alerts were -- I'm new to blogging :) Belated congratulations on your baby girl!